An erect perennial with rhizomes and contains an inflorecence with green globe shaped balls. Commonly found in poorly drained soils. Leaves are sharply triangular in cross-section, with concave sides. Leaf blades measure 3-9mm in width and are very glossy in appearance and hairless. Green and globe shaped, usually in clusters containing 1-3 globes. Fibrous root system with rhizomes. Green and globed shaped seedheads, glossy, and triangular shaped leaves in cross section are prime identifying characteristics of globe flatsedge. 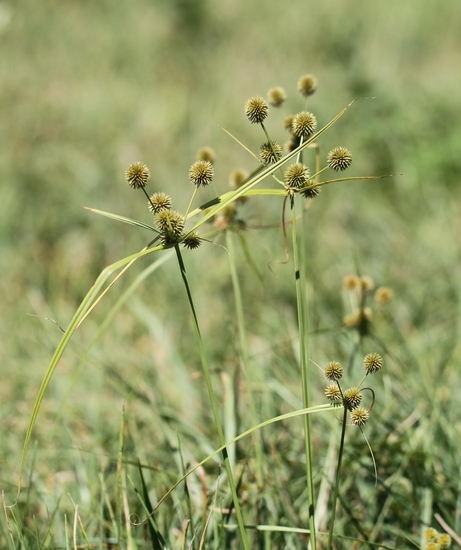 The seedhead is the most obvious characteristic that distinguishes globe flatsedge from similar sedge species.